440 p., 2 ill., 14,8 x 20,4 cm. With contributions by Jan Assmann, Kurt Bayertz, Wilhelm Otto Deutsch, Martin Fontius, Ralph Köhnen, Lothar Kreimendahl, Ekkehart Krippendorff, Laurenz Lütteken, Klaus Oehl, Wolfgang Proß, Helmut Reinalter, Thomas Seedorf, Wilhelm Seidel, Michael Stegemann and Stefanie Steiner. 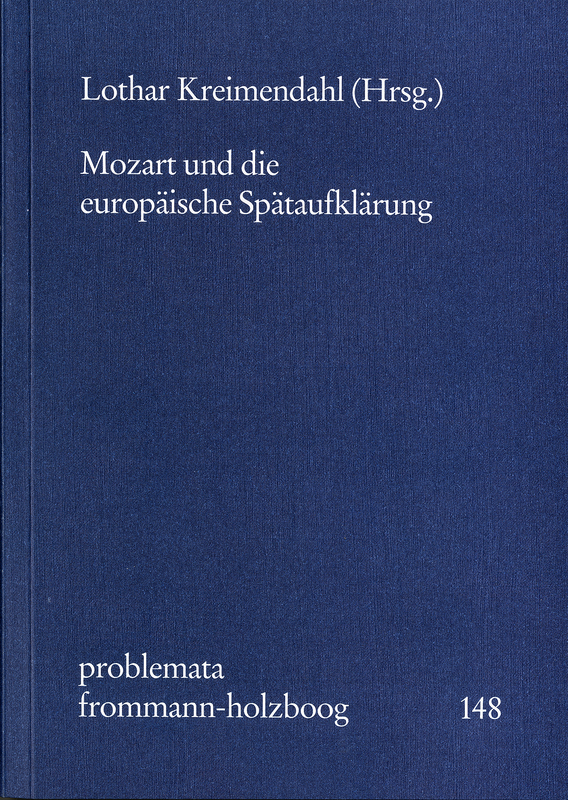 Contextualizing Mozart’s work in its period has to be considered an urgent desideratum in Mozart research. The volume presents articles of well known specialists of varying disciplines who pursue the influences the late European Enlightenment and its philosophical trends in particular has had on the seven great operas. Articles on the Josephinean kind of Enlightenment, on Mozarts knowledge of literature and on his attitude towards religion complete the revision of the prevalent image of Mozart and show him as a character who attentively noticed the intellectual progress of his time and reflected on it in his opera-work.